Welcome to the 567th Edition of my series. 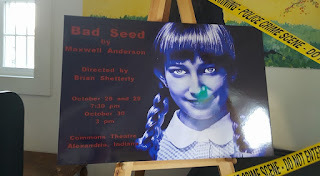 Rehearsals have started for BAD SEED and I think it will be a real good show, especially for Halloween. The show is at the Commons Theater in Alexandria, Indiana and performances are October 28, 29, and 30 so come show your support for this drama which in my opinion is the most underrated genre in theater. Other than that, just experiencing the struggle of the NFL in reality and fantasy. I will get on with my selections for the week. Children on their Birthdays (2002): I start the week out with this coming of age tale which is based on a short story by Truman Capote. 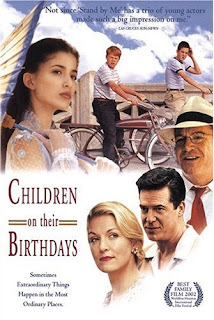 This takes place in the 40s in small town Alabama where a 13 year old girl named Lily Jane, played by Tania Raymonde, and her deaf mother, played by Phyllis French, move into the neighborhood making two thirteen year old friends Billy Bob and Preacher Star, played by Joe Pichler and Jesse Plemons, go nuts over her compromising their friendship. Sheryl Lee, Christopher McDonald, Tom Arnold, and many others co-star in this movie. This was a pretty well crafted story. Tania Raymonde was very good as the rather mature 13 year old. It also made some subtle hints of segregation and where Lily Jane addressed it some in a good way. It is a good family movie that is worth a look. 25th Hour (2002): Now I get a little more gritty. 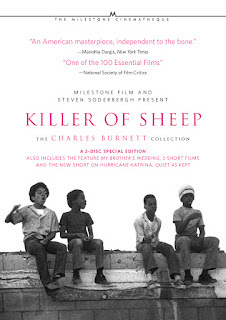 Spike Lee directed this film based on the novel by David Benioff. 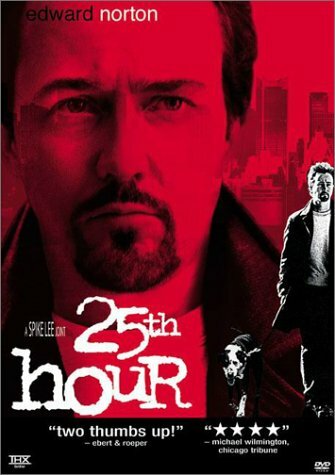 Edward Norton stars as Monty Brogan who is about to start a seven year sentence for drug dealing. He spends his last day before prison with his friends Jacob and Frank, played by Philip Seymour Hoffman and Barry Pepper, and his girlfriend Naturelle, played by Rosario Dawson. In this day before prison, he must reexamine his life and how he got into the predicament. Anna Paquin, Brian Cox, NFL great Tony Siragusa, Patrice O'Neal, and many others co-star in this film. This is a lot different for a Spike Lee movie. David Benioff is known as one of the creators of the popular HBO series GAME OF THRONES. It is a really good movie of trying to make things right before a life changing moment happens. Norton is good as always as Monty and does a good job of going back and forth between the modern time and the times before the arrest happened. 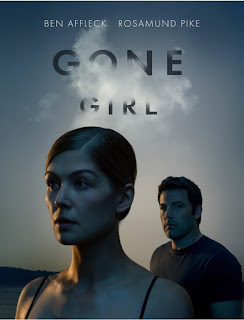 Gone Girl (2014): The first time I saw this movie was at Shera's house when we decided upon this one for a Movie Night at the Shera session. I decided to give this a rewatch and still really enjoyed this tale of suspense. David Fincher directed this film based on the novel by Gillian Flynn who also wrote the screenplay. Ben Affleck stars as Nick Dunne whose wife Amy, played by Rosamund Pike, has disappeared. When this happens, many dark secrets come out about their marriage making Nick a prime suspect. Neil Patrick Harris, Tyler Perry, Kim Dickens, Patrick Fugit, Sela Ward, and many others co-star in this film. Nothing in this film is what it seems and talking about it will just give things away. I recall when Shera and me watched this, we tried to guess what might happens but were wrong. I know some said this was unrealistic and maybe they were right but I don't really care. This is the ultimate look at a bad marriage and also realized it seems to make a statement on how the media can make someone look the way they want them to look. 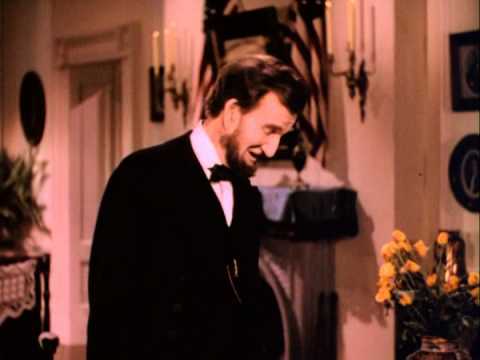 Lincoln in the White House (1939): This is my historical short for the week. Frank McGlynn Sr. stars as our 16th president Abraham Lincoln. It goes into news receiving some bad news which leads to his famous Gettysburg Address. It also goes into the relationship with his wife and son Tad. Mostly gives us the history that was taught at school. Pretty insightful and a good scene is where he is playing with Tad. 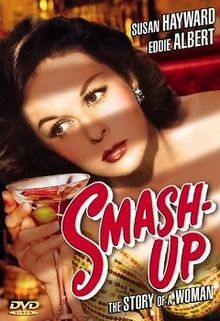 Smash-up: The Story of a Woman (1947): Susan Hayward stars in this film as rising nightclub singer Angie Evans who marries struggling singer-songwriter Ken Conway, played by Lee Bowman. Angie takes a step back in her career while Ken gets on the rise with his career. They also have a child but her life of luxury becomes her downfall while she falls into alcoholism. Marsha Hunt, Eddie Albert, and many others co-star in this film. Hayward is the highlight of this film and a breakthrough performance. At the time, it was probably pretty shocking showing a female alcoholic. Male alcoholism was portrayed a little bit but I know it was not nearly as shown as females in alcoholism. This movie is loosely based on entertainer Dixie Lee. Unfortunately they did not get to do everything they wanted with the Production Code but still a good look at alcoholism. Jubilee (1978): Derek Jarmon wrote and directed this surrealistic film that could take multiple viewings to even get. It is a look at British punk rock culture where Elizabeth I comes into the modern era disappointed to find this to be a violent waistland. 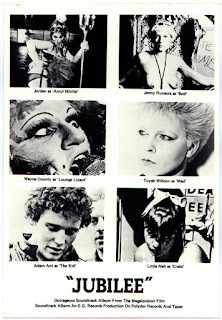 This is some very bizarre imagery and some really interesting music numbers including Adam Ant, Siouxsie and the Banshees, Brian Eno, and others. Richard O'Brien, Jenny Runacre, Nell Campbell, Toya Willcox, Adam Ant, Ian Charleson, and many others co-star in this film. Mostly of interest to those into the punk rock scene from this era. Shows Adam Ant before his hit song GOODY TWO SHOES and with his band Adam and the Ants. Also of interest to those into the more surrealistic films. It is available on DVD through the Criterion Collection. Under the Tuscan Sun (2003): I go into a little more conventional of a film. Audrey Wells directed this film based on the memoir by Frances Mayes, played by Diane Lane. Mayes is a writer who has recently divorce and while on an Italian vacation in Tuscany, she impulsively buys a villa hoping it helps to get her life in order. She soon gets to know the eccentric neighbors while also falling in love. Sandra Oh, Lindsey Duncan, Raoul Bova, Pawel Szajda, David Sutcliffe, Kate Walsh, Don McManus, Elden Henson, and many others co-star in this film. Lane does a great job as the conflicted writer not really knowing what she wants but taking a chance. It has some good scenery along with humor and romance but not a usual sort of love story I found. 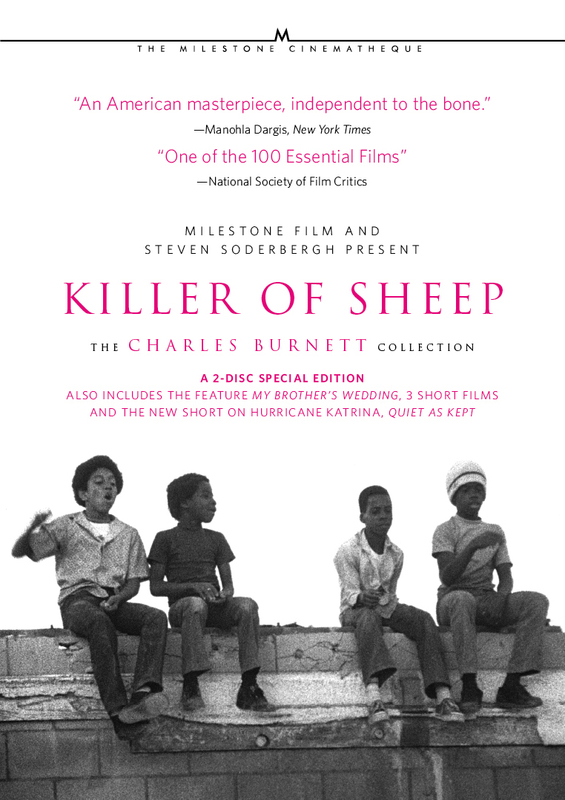 Killer of Sheep (1978): Charles Burnett wrote and directed this independent film which centers around a black family in an L.A. district. Henry G. Saunders stars as Stan who is employed at a slaughterhouse and affects his home life. The film is shot through a series of episodic events of things like friends trying to involve him in a criminal plot, a white woman propositioning him to work in her store, and along with a friend, tries to buy an engine. It also goes into his family life depicting life in a lower-class family. This clearly has influences of a lot of foreign film directors in the way it was shot. Burnett gave this everything he had including producing it and being the cameraman. It took a long time for this to get a lot of exposure until Steven Soderbergh gave a donation to get this from 16mm to 35 mm eventually getting released into a DVD set that featured Burnett with some of his other films. 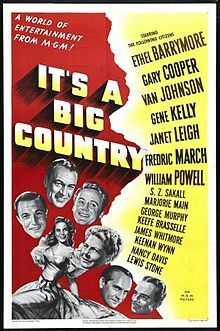 It's a Big Country: An American Anthology (1951): I had never heard of this until I was looking at TCM On-Demand and came across it. This is an episodic film that had eight directors attached which were Clarence Brown, Don Hartman, John Sturges, Richard Thorpe, Charles Vidor, Don Weis, and William A. Wellman. This is covered in multiple episodes dealing with racial tolerance, religious tolerance, self-centeredness, and myopic reasoning. This has quite the all-star cast with Ethel Barrymore, Gary Cooper, Nancy Reagan, Van Johnson, Gene Kelly, William Powell, Fredric March, Lewis Stone, Keenan Wynn, and many others. It was a propaganda look at Americana from this era and had some good areas of interest like the prejudice that they deal with which was not black and white but more of nationality. It was worth a look on this rather overlooked film which was on tcm.com but is gone now. 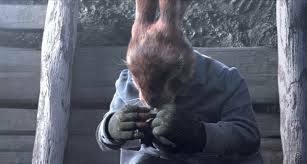 Poilus (2016): I end the week with this graduation short film that appears to be from this year. This is an animated short film which has no dialogue and shows rabbits at war. In doing some research, I found that Poilus means a French soldier in WWI. It has some really good animation and captures the horrors of war and makes good use of rabbits. This is available on youtube and is worth about 5 minutes of your time. Well, that is it for this week but I do have an early Madness segment. 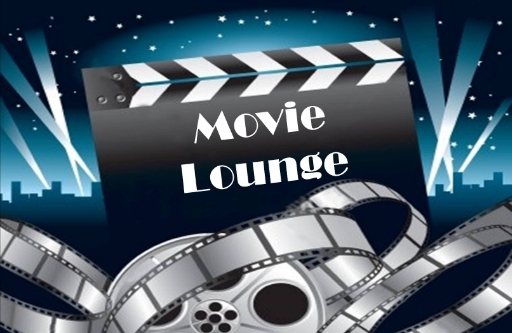 Tell me what you like and dislike and stay tuned for next week which so far includes Christina Ricci, Tom Cruise, Jessica Chastain, David Lynch, Lionel Barrymore, Pam Grier, Jerry Lewis, Gregory Peck, Anna Paquin, and many others. Escape from Tomorrow (2013): Next week officially starts my favorite annual contest of the Madness but our Hauntress Elizabeth offered early points for watching this movie so I thought I'd give it a go. 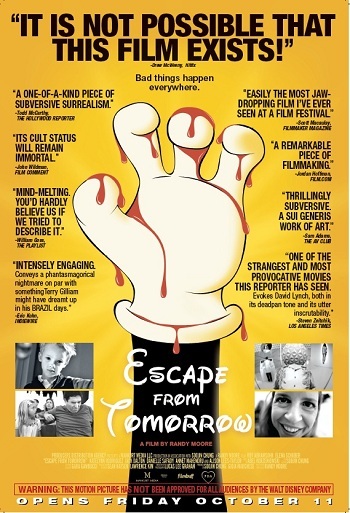 Randy Moore wrote and directed this horror film which was filmed at Disney World. Roy Abramsohn stars as the recently unemployed father Jim whose wife and kids are all on vacation with him and his sanity comes into question with the encounter of a couple underage girls. This sounded interesting to me but I could not get into it. For me, there was not much to it, maybe I'll try it again for the Madness next year.